I never met Homer's father. He was born in the same year my father was born (1922) and like my father served in World War II. My father served as a radio operator for flights in Burma, and returned home on army transport with a bag full of snakes. But that is a story for another time. Homer's father was a part of the group called Hell On Wheels. First division into Europe and North Africa, Homer Sr was injured in North Africa, and taken out of commission for a time. His request for going back into the action was granted, and he ended up in France and then into Germany. History writers summarize the 2nd Armored Division with many statistics: many awards went to this group, losses of life were relatively small, their tanks rolled across the countryside to end up helping end the war with Germany. Homer's father told stories of doing everything: as they moved through Africa and Europe they slept under the stars, operated tanks, motorcycles, weapons, repairs, food. The other day we received a freezer from the house of a friends father...after the father passed away. The house goes on the market today, everything was being sorted through and cleared out, and a big dumpster was out front. After a bit of checking what was slated for going out in the dumpster Homer located this patch. 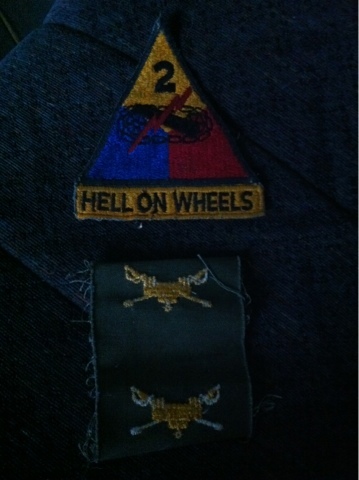 Not the WWII insignia, a later iteration of Hell On Wheels. It certainly brought back a flood of memories for Homer. And the freezer will hold wintertime food for us. A good day.